Get ready for some amazing dives! 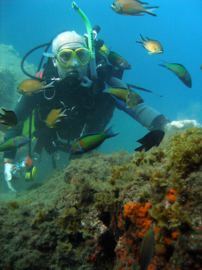 Gran Canaria is one of the best places to dive in the Canaries and Europe! the sub-tropical waters are warmed by the gulf stream. the variety and colours of the marine life will amaze you! "I didn't expect to see so much!" is a common response after diving in Gran Canaria for the first time. 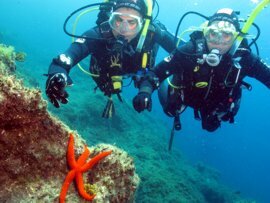 Coming to Gran Canaria, and looking for the best places for scuba diving? Then the Spanish national newspaper El Páis said don't miss the most popular site "El Cabrón" or Arinaga Marine Reserve. You will see how the combination of beautiful underwater scenery, and ten amazing dive routes filled with abundant and varied marine life in big shoals have made this the most popular dive site on Gran Canaria. Your dives from our award winning PADI 5-Star Dive Centre at Casa Limon are right next to this hot-spot for diving and marine life. Our scuba diving and courses are so highly rated that we achieved the PADI 'Outstanding' Award for 2018. 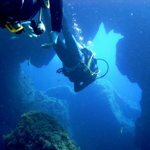 What will I see when Scuba Diving in Gran Canaria? You can buddy up with other experienced scuba divers here all year round and you will always see amazing creatures, with endangered species such as angel sharks, filefish and rays in winter and spring, sea-horses and triggerfish in summer and big shoals all year round. For your camera there are brightly coloured glasseyes, tiger morays, cleaner shrimps, nudibranchii, and cephlapods. Our mature multi-lingual instructors know the best sites in Gran Canaria for diving, and we can show you stunning underwater scenery, big shoals of fish or mysterious wrecks. You can rely on our their expert knowledge of our 'local patch' to show you the hidden secrets, such as the hiding places of the rare spiny pufferfish, or other rare species such as soldierfish and 'special places' in the El Cabrón Marine Reserve such as the local cleaning stations or hidden caves. 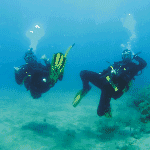 We cater for divers with all levels of skill from none to expert. Choose the programmes that suit you and your diving partners best. 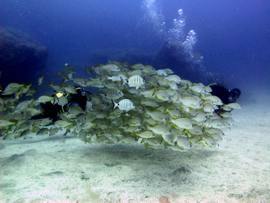 Who recommends the El Cabrón area for scuba diving in Gran Canaria? 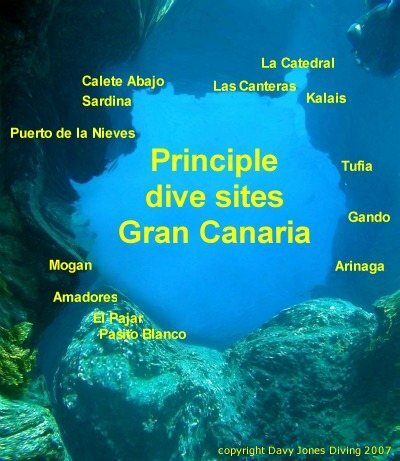 "One of the most spectacular sites in the Canary Islands"
5 stars - "Perfect guided dives in the El Cabron Marine Reserve"
Mr boyfriend and I are both Advanced Open Water divers, and as soon as our credentials and insurance were checked (as it should be!) we were off on 10 awesome and varied dives on the marine reserve and also in the north of the island in Sardina. As we are experienced in diving around the world, it was fantastic to know how safe and knowledgeable the team were - especially Ed and Brett! We really could not have asked for more. I highly recommend Davy Jones for their professionalism, experience and friendliness. I would most certainly return! "Topspot - De unieke duikplaatsen in het natuurpark voor Arinaga"
Listed as a Site of Special Scientific Interest by the European Union since 28/12/2001. We are the closest PADI 5 Star Diving Centre to this amazing high-energy divesite, and our expert professional instructors know the highlights, the sights and the secrets better than anyone else. Our team is mature, speak English, Spanish, German, Dutch and Italian, and we have three PADI Elite Instructors.Our Dive Centre in Casa Limon has some of the best facilities in the Canaries, including a large private garden to relax in between your dives. With our reputation, facilities and experienced multi-lingual staff it is little wonder we are one of the three most popular PADI 5-star Dive Centres on Gran Canaria and we offer a great dive experience for everyone from complete beginners up to experienced scuba divers. We are a family friendly diving centre where your safety is highly important, as is making sure you enjoy Gran Canaria's best diving site. The first time you dive in the subtropical waters around this Island you will be amazed not only by the huge shoals of fish but also the variety of colours and species, from minute hermit crabs and vivid damselfish up to intriguing but critically endangered species including angel sharks. The relatively low levels of sea urchins, and good plankton production, means that this area still has thriving habitats and good biodiversity compared to many of the other dive sites in the Canary Islands. We are one of the top ten PADI Five Star Dive Centres in the Canaries, and already hold two PADI Certificates of Excellence. Our PADI Elite Instructors are mainly at the senior MSDT level, and fluent in English, German, Spanish, Dutch and Italian, and you can pick from the complete list of all our PADI courses including our highly rated PADI Open Water Course or our Introductory try-dive experience for beginners, pages on snorkelling in the Arinaga area, and don't miss more challenging courses such as the PADI Advanced Open Water Course! To plan your scuba diving in Gran Canaria, select your language below or at the top of the page, or flip through our pages - Our team speak English, German, Spanish, Dutch and Italian, so our website has over 200 pages in six languages and is full of information to help you plan your exploration of the El Cabrón Marine Reserve in Gran Canaria and the Canary Islands!